As I was sitting at lunch today, I realized that I will never tire of people watching in the Fez Medina. 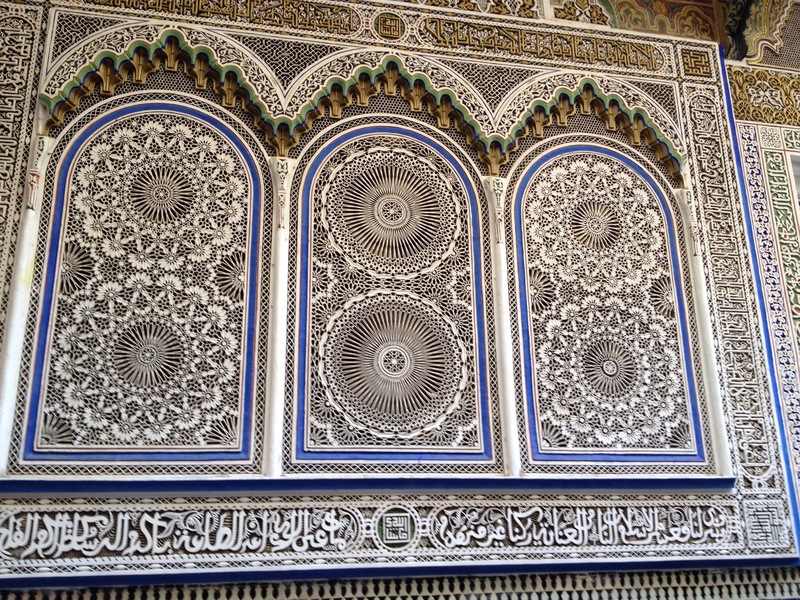 With over 9800 streets, the Medina in Fez is by far the largest Medina in Morocco. It’s almost impossible not to get lost, and it’s inevitable that you’ll have some great entertainment along the way. I decided to eat lunch in a small, covered side street of the Medina. In an otherwise torn up alleyway, a man and his wife set out plastic chairs around a small table and covered it in a regal purple velvet for a “classy” effect. 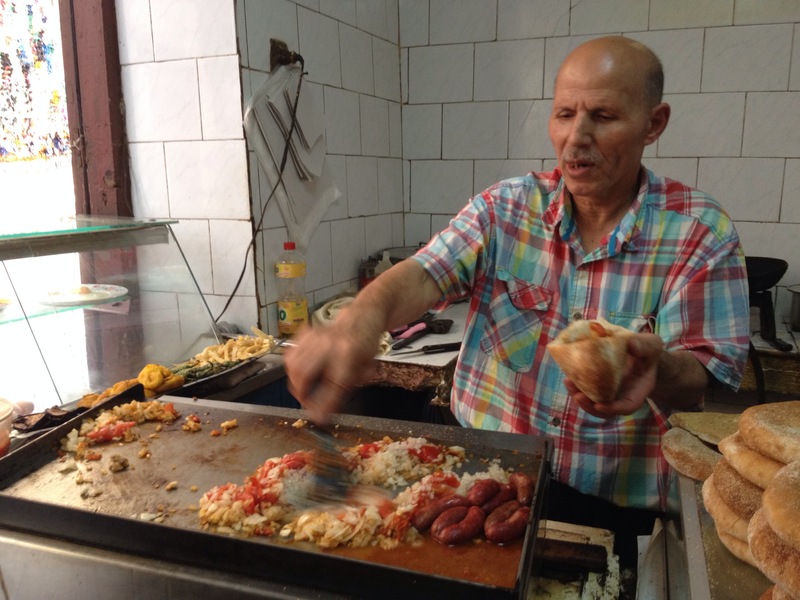 Even though I’d just turned down the touts at about 100 restaurants along the way, this mans enthusiasm drew me to have a snack. He reminded me of a plump version of Roberto Benigni in Life is Beautiful. His excitement over his wife’s food, the way he smiled and yelled “beautiful! !” after I told him everything tasted great, and the way he jumped around trying to make it all perfect: adjusting napkins, running to the corner store for cold water, checking salt and pepper levels. But he was right, his wife’s cooking was sensational! It amazes me how many things can happen all at once in a medina. While I ate at the velvet covered patio table, a man across the alley sold dates in front of an old public fountain. Next to him, a rooster perched on the edge of a parked motorcycle, crowed away incessantly. Beside the rooster was an iron worker, sending sparks flying into the sky towards me while he welded together a cast iron chair, sans protective gear. All of a sudden a man yelled “balak!” Meaning “get out of the way” as he dragged a huge horse through the medina, carrying close to 14 propane tanks on it’s back. This is all such a normal spectacle, no one bats an eye at the absurdity of it all. “Shakira! You’re back!” Announces a man as I pass by him for a third time today, wandering around in a circle, trying to find my bearings in the labyrinth. The problem with getting lost here is, everyone notices. A thousand people must have passed by him since I’d wandered by, yet I’m the one he remembers. Everyone calls me Shakira here in Morocco. Whether it’s the only blonde woman they have ever seen before, or it once got a positive reaction and the word spread nation wide I’m not sure. But, c’est la vie, it’s my newest nickname and I hear it everywhere I go. As I come upon a familiar street, all I hear are whispers of “chameau, chameau!”. “Chameau” is the French word for “camel”. Camels are given to women as dowry gifts when a wedding is arranged. A beautiful woman in Morocco will usually get between 200 and 300 camels for a dowry, an ugly one, just 3. “I will give you 3000 camels” yells a young guy as I pass by in the street. “I will give you all the camels in Morocco” shouts the man across from him. I roll my eyes… There’s no way he can follow through on that promise! In front of me a young guy sees me walking, he turns around to his clothing store, takes a mannequin and immediately rips it’s hand away from it’s body. I stood, shocked as he turned around to face me with it. “Madam!” He announces, “I give you my hand… in marriage” and passes me the amputated plastic hand. I had to laugh. I respect his pun, but reject his proposal. Apparently the medina is a good place to find husbands! On top of that it’s a fabulous place for some retail therapy, and it’s also a workplace for thousands and thousands of Moroccans. 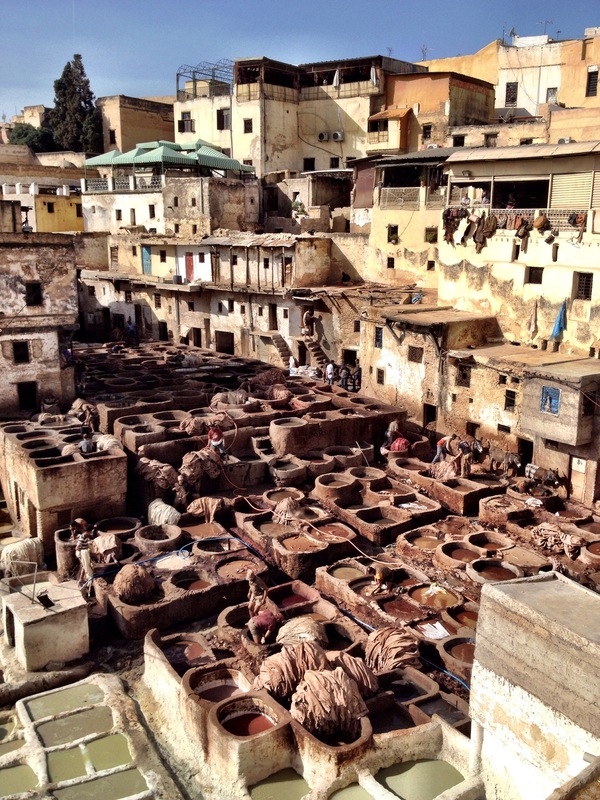 Restaurateurs, metal workers, weavers, salesmen, and most notably in Fez, leather workers. 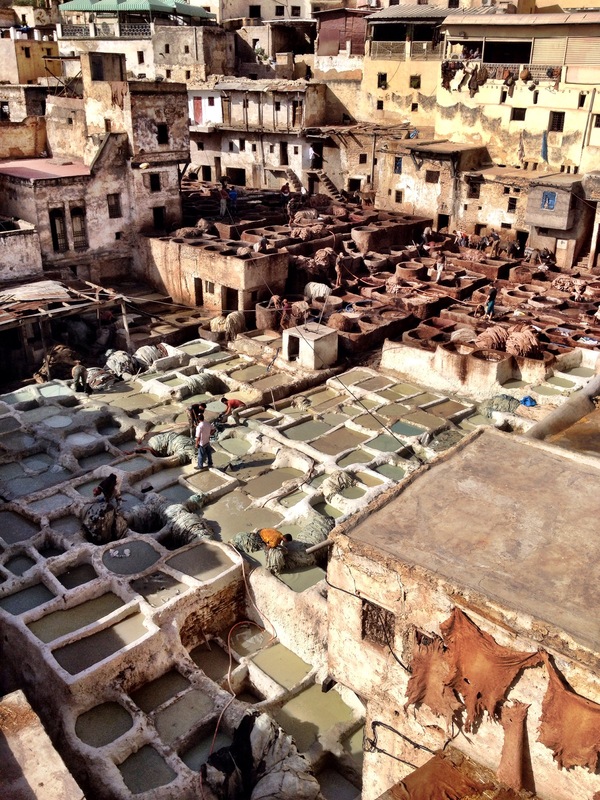 The tanneries are one of Fez’s most popular sites. The city is known for it’s supple leather: jackets, bags, wallets and more. 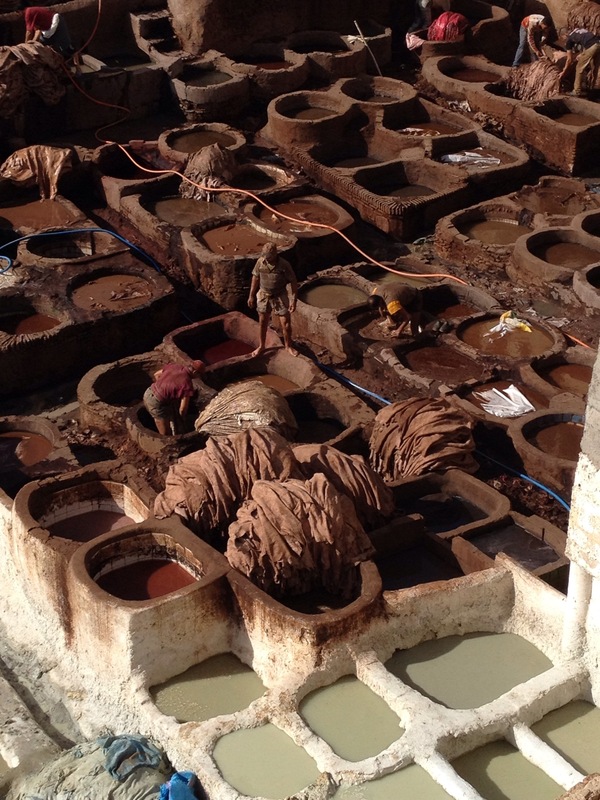 There are three tanneries in Fez, the largest of which I managed to visit. You can tell you’re close to a tannery because of the utterly nauseating stench that emanates through the nearby streets… The hides of sheep and cow and camel, sitting in the heat of the day; the mix of pigeon poo, cow urine and limestone; and the chemical smell of the dyes used to colour each pelt. It’s horrific to say the least. Tourists are given mint sprigs to hold in front of their noses to freshen the air, but no amount of mint can hold back the reek of the tanneries. Tannery work is important work. People are born into the profession, and work at their jobs with a certain sense of pride: fez leather is the best leather. But with all the prestige of the final result, the work is terrible. It’s ancient methods come along with ancient safety procedures. Men work in temperatures reaching up to 47 degrees, with no skin protection, wading in chemicals that reach thigh high. They are paid per hide, instead of per hour, so speed is a more important factor than safety. 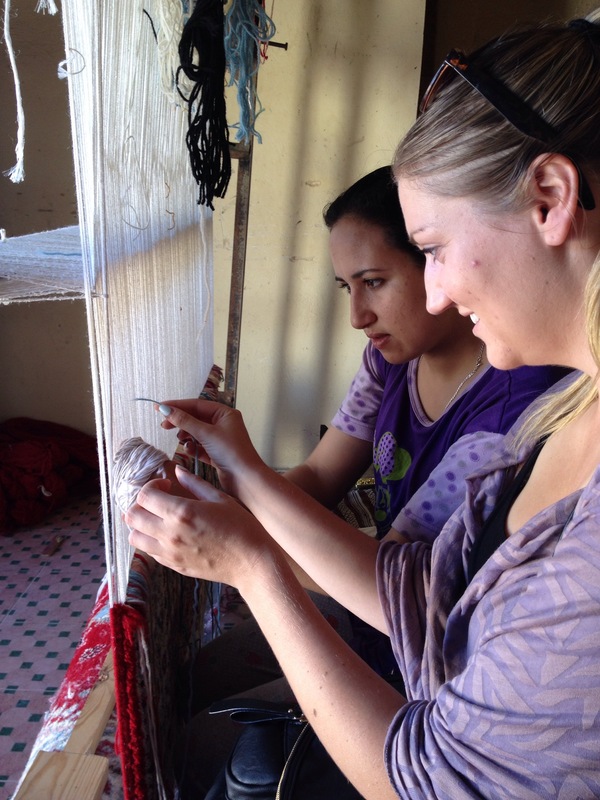 But the process is fascinating: hides are dried, washed and stripped of hair. They are then soaked in a mix of limestone, pigeon excrement and cow urine. 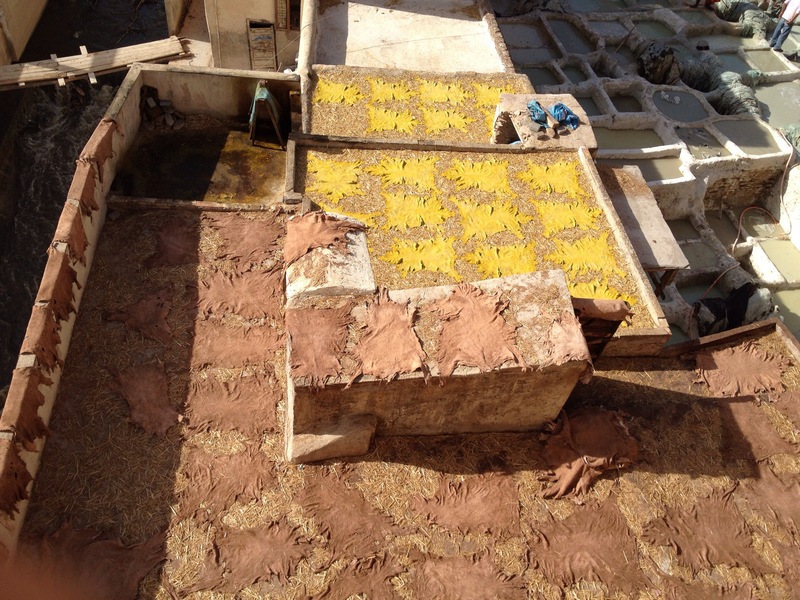 From there they are moved to pits filled with natural dyes: indigo, saffron or poppy. Then finally, they are laid in the sun to dry again. The process is insane to watch. Looking down from the terraces of neighboring shops give you the best view of the chaos below. It’s true, I will never get tired of people watching in the Fez Medina. It is a world of unusual sights and smells and sounds, and you’re bound to find something new around each corner. 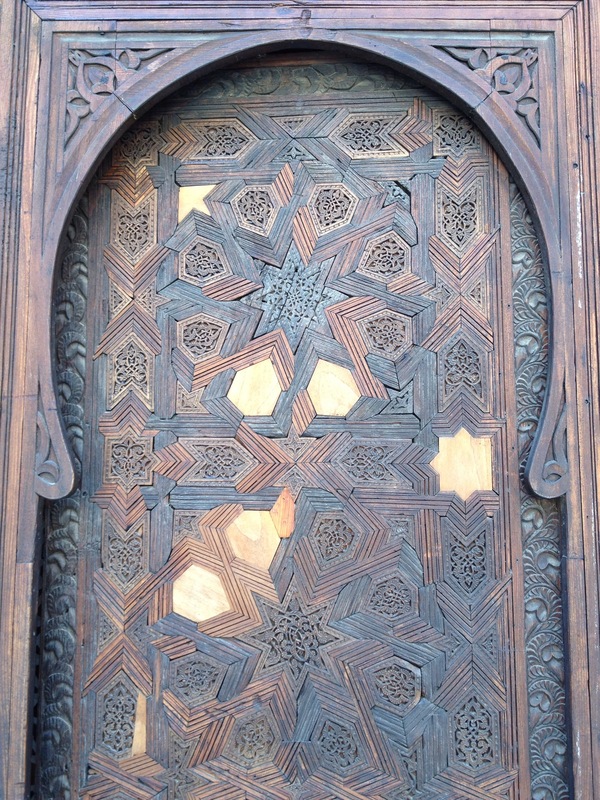 Unfortunately, my time in Morocco has come to a close, and Barcelona awaits as my next adventure! 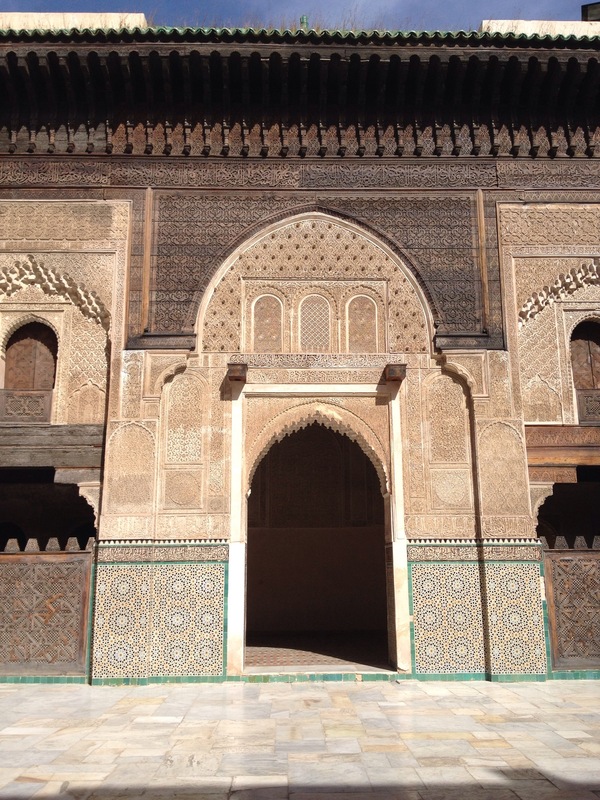 This entry was posted in Africa, Morocco and tagged chaos, medina, shakira, tanneries, Travel, work conditions by hilarylust. Bookmark the permalink. 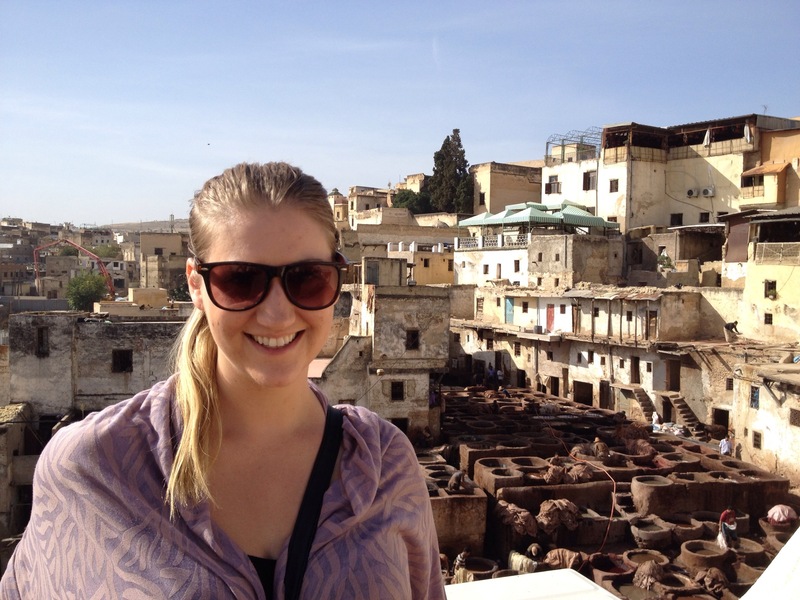 Ok so the amazing race is in Morocco and going everywhere you are. I heard that the Amazing race was just in Morocco! How funny! I was in Barcelona and Andorra a couple days ago and also loved them both! The Sagrada Familia was unbelievable! !